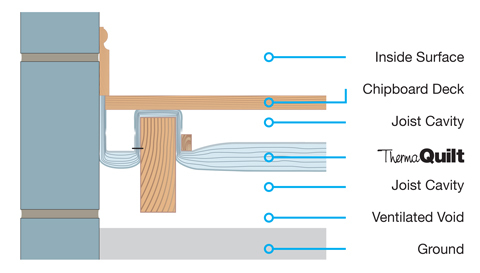 Installation of SuperQuilt for Timber Frame wall applications and additional insulation products should be in accordance with the certificate, YBS fixing instructions and current good building practice. SuperQuilt is applied directly from the roll either vertically or horizontally depending on the wall height, pulled tight and stapled onto the timber studs at minimum 300mm centres. SuperQuilt should be overlapped at each joint by approx. 50mm and stapled onto the battens, the joins should be sealed using 75mm YBS Foil Tape. Perpendicular counter battens, recommended 25mm by 38mm are fixed to the wall. Battens must always be placed at the top and bottom of the wall and around the perimeter of doors and windows. The plasterboard is fixed over the materials and onto the battens in the usual manner.